2017 Liquid Force Super Tramp Wakesurfer. Take a look at the new 2017 Liquid Force Super Tramp Wakesurfer at S2AS! Now introducing the Super Tramp, Liquid Force's newest skim style board. After riding on the Doum Pro for several years, Dominic Lagace has a new pro model for 2017. The waves have continued to get bigger and better in recent years. It only makes sense that skim style boards needed a revamp. The Super Tramp is built to perform on the monstrous waves. A much fuller nose and tail than most traditional skim style boards gives the board the same amount of volume as much longer boards. A much quicker board that is easier to spin, flick, and rip behind the boat. While still a true skim style board, it definitely has a surfy feeling to it for more snappiness on turns and slashes. The Super Tramp is built with a classic surf core construction and a special carbon triax fabric weave on the top deck. 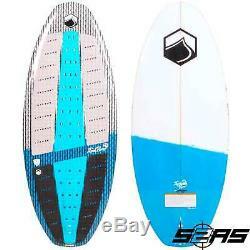 This gives the board increased torsional rigidity and added flex for a more lively feel. The sharp rails give the board quick response from edge to edge. A single 1.5 skim fin will give the rider the necessary hold for surf style maneuvers while still easily breaking free for all those skim tricks on the lip of the wake. Dual Layer Carbon Triax Deck. Single Concave to Slight Double Concave Hull. Concave Deck Surface for Increased Board Control. EPS Foam Core w/ Stringer. Square Grooved EVA Traction Pads w/ Kickstop and Archbar. Established in 2002 S2AS has become known, as the rider owned rider run extreme sports leaders in the UK. S2AS is perfectly located in Poole, Dorset only 20 minutes from the only full Wakeboard cable on the south coast where you can demo all of the Wakeboard equipment we stock in store. We pride ourselves on offering the highest quality of Kitesurf lessons available. All of our instructors are British Kite Sports Association (BKSA) trained and highly enthusiastic kitesurfers themselves with years of experience. Here at S2AS were not about just teaching and sending you off in to the world. 90% of our customers keep returning every year to take advantage of the services we provide this allows us to build a relationship and understand exactly what your looking for. This is a not just another watersport this is a lifestyle. S2AS is not just a kitesurf school in Poole, Dorset, Water or snowboard sports shop were a lifestyle brand. Our team lives and loves what we do, If were not teaching kitesurfing or in the shop were at the Wakeboard cable on the beach Kitesurfing or taking trips to the snow. Were putting in the groundwork constantly testing and proving our knowledge so that we can provide the best quality equipment on the market to you. We don't stock anything that we don't believe in, We understand the need you have to find gear that you're going to enjoy and trust riding every time you go out. We spend days testing so you don't have to. Some of the top brands that we stand by are Cabrinha Kites and Slingshot Kites for kitesurfing. The item "2017 Liquid Force Super Tramp Wakesurfer" is in sale since Monday, September 25, 2017. This item is in the category "Sporting Goods\Waterskiing & Wakeboarding\Wakeboards & Kneeboards". The seller is "s2as" and is located in Dorset.